Hiking Mount St. Helens in the moonlight is an experience you will never forget. Compared to hiking the trail in the daylight, it is a completely different experience. Above treeline, an already magical mountain broods in a new way. The rocks seem to glow. The stars are amazing. And, lit by the full moon, the landscape is entirely different. But why? The thought of hiking at night might provoke a sense of danger, and under the cover of darkness there are risks to consider. 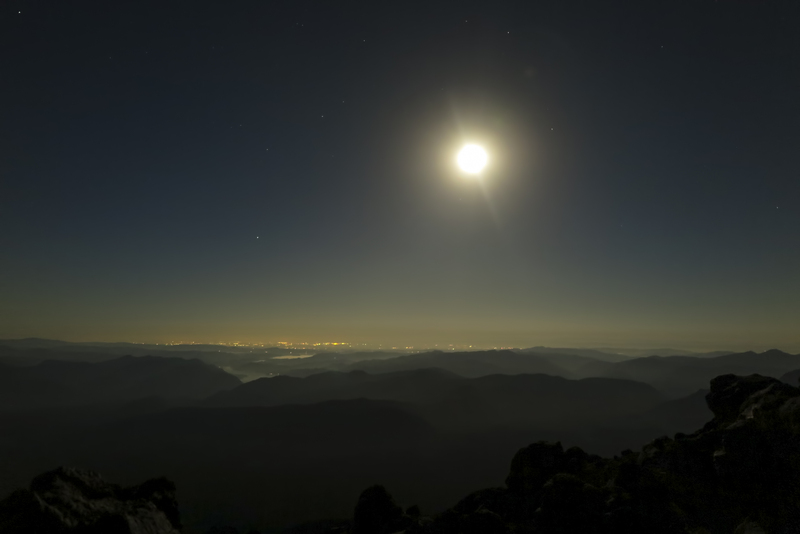 Still, while careful consideration is important, the benefits to a night hike under a full moon vastly outweigh the risks, especially in familiar terrain. The moon casts a bright light over Mount St. Helens and southwest Washington. Dotty Scott. Firstly, the climb is much more private. Mountain ascents are an exception to the rule, and many summit hikes begin under the cover of darkness. However, on Mount St. Helens, most routes to the rim are non-technical and relatively swift. As a result, most ascents occur during the day. An ascent that begins with the moonrise weeds out those who prefer to sleep in until daylight. The climb is also much cooler. Since its violent eruption in 1980, the route to the rim travels over the sharp magmatic remains—jet-black heat sinks that soak up the sunlight on a hot summer day. A night climb is much cooler, and if you hate heat then this is the way to climb the mountain. It's cool enough that you will need to remember to bring layers of clothing and a windbreaker. The views are breathtaking—but differently so. The colors and bright contrasts of mid-day are gone, the unfurling stretch of forest to the horizon exchanged for shadows, darkness, silhouettes, and the penumbral spectrum of the troposphere at sunrise. The blanket of night reorients the familiar in wildly different light. The first light creeps up on Mount Adams, east of Mount St. Helens. Dotty Scott. When purchasing the permits, look for a July, August, or September full moon. If you can't reserve a permit night of, then shoot for a night as near to the full moon. Pay special attention to the time of moonrises and moonsets. Although the hike occurs at night, do not think of this as hiking in the dark. The moon is so bright that no other light is needed to navigate above tree line. (You will need a headlamp in the forest.) Wooden pole markers usher climbers along the blocky boulders of Monitor Ridge for 2,500 feet of elevation gain, and the trail is no harder to follow at night than it is during the day. The moon provides enough light to turn off headlamps as if it were daylight. 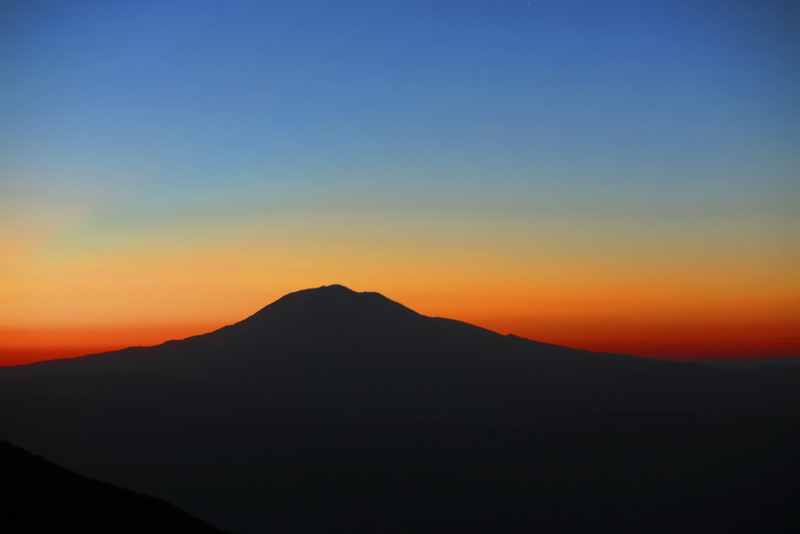 A vibrant sunrise from the summit of Mount St. Helens is a fitting reward after a moonlit night hike. Dotty Scott. 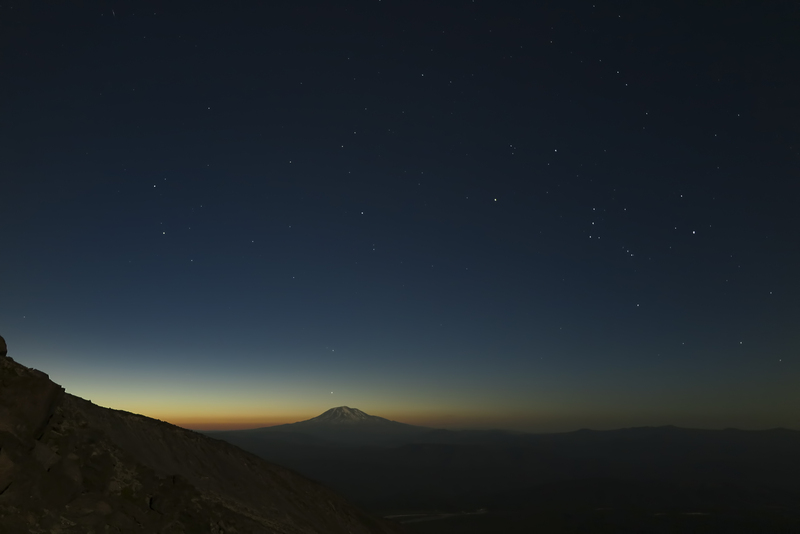 The night sky from Mount St. Helens is truly memorable, made even more so by the rising sun behind Mount Adams and the alpenglow of a morning above a fuming caldera.